#1 Pure Sea Harvested Pelagic Fish Oil! Increased Energy & Fat Burner! Supports Healthy Heart, Brain, Nerves And Vision! High In EPA And DHA! In today's market there are many types of fish oil that are cheap and low quality. Some are cheap and some are bit more costly than others with NT3 Premium Fish Oil, we manufacture our product in a strict quality control environment. We ensure that NT3 Premium Fish Oil is FREE of all harmful contaminates. What to look for: Fish oil and Omega 3 Supplements are taken by millions of Americans yearly, but that doesn't mean they are of high quality. When looking to purchase premium quality fish oil you must find out how it is manufactured and if it's in a controlled setting as well as what type of fish there using. This is why we also do a certificate of analysis with each batch that is created to ensure we provide a premium quality and contaminate free Omega 3. Why Choose NT3: With so many difference types of brands on today's market we made sure we can offer you a premium quality product without having to pay a premium price. 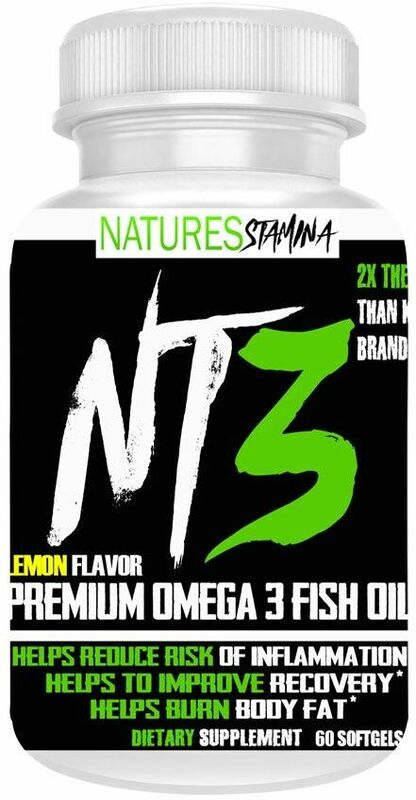 Using only 100% pure sea-harvested pelagic fish oil, making NT3 Premium Omega 3 ensures you will get high EPA and DHA. These nutrients are important for many things to maintain your bodies health. Not only will it help with Healthy Brain and Nervous System and it will help contribute to a healthy Heart and Joint Flexibility. Looking to take your workouts and daily fitness lifestyle to the Max? Pair NT3 Premium Omega 3 along with Natures Stamina NT5 Testosterone Booster and NTW Performance and Energy for Women. Lemon This is a Buy 1 Get 1 FREE offer!